Publisher: Grand Central Publishing, Boston, MA, U.S.A.
Bryan Fogel and Sam Wolfsen deliver the ultimate book of Jewish humour. It contains the Jewish nursery blueprint, complete with panic room, fireproof wallpaper and guardian ninja, the top-ten list of Jewish 'dont's', the complete timeline of Jewish expulsion, and much more. 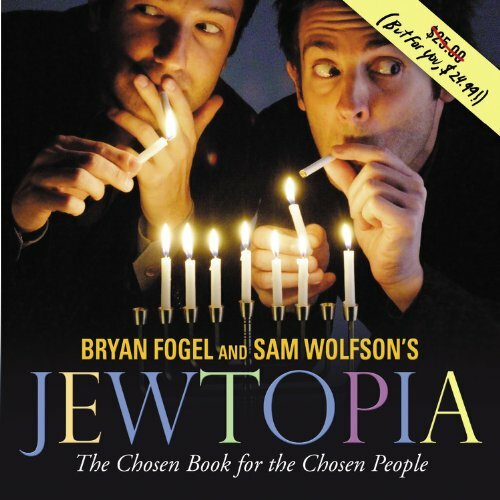 From Bryan Fogel and Sam Wolfson, the creators and stars of the national smash hit play, Jewtopia, comes the most hilarious, over-the-top guide to Judaism unlike anything you've ever seen. So comprehensive that owning a copy ensures that Elijah himself will show up at your Passover Seder!